Anti-Chance: A Reply to Monod's Chance and Necessity is a critique of Jacques Monod's essay on the natural philosophy of modern biology. 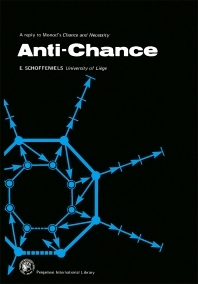 It explores the concepts of chance and necessity, central themes of Monod's work, and specifically whether life is the result of coincidence of diverse independent chains of causality or, on the contrary, whether it obeys the more fundamental concept of chance as proposed by the Danish School of physicists. Questions such as the chance or the inevitability of it all, the sites and sizes of the knowledge gaps and as to whether they will be filled with physics and chemistry on the one hand or seasoned with metaphysics on the other, are examined. This book is comprised of 10 chapters and begins with reflections on biology and the argument that biology can only enrich itself by abandoning a teleological or finalist mode of thought. The discussion then turns to probabilities of chance, with emphasis on three different mechanisms of the intervention of chance. Subsequent chapters focus on the link between thermodynamics and biological order; the basis for a theoretical biology and 14 propositions to which the fundamental attributes of cells can be reduced; the molecular basis of instinct; and the relationship between speech and consciousness. The applicability of cybernetics to biological systems and their component metabolic cycles is also considered, along with the structure of chance. This monograph will be of interest to scientists in fields ranging from biology and natural philosophy to physics, chemistry, and physiology.